It's 10:18 in Berkeley, USA right now. View over Berkeley A great panorama view of Berkeley and the San Francisco Bay Area from the Lawrence Hall of Science, UC Berkeley. 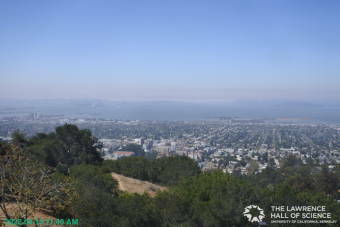 Berkeley, California: West Berkeley (facing SF), 0 miles away. Tiburon, California: Panorama View, 10.1 miles away. San Francisco, California: Potrero Hill, 10.4 miles away. San Francisco, California: San Francisco Skyline, 10.4 miles away. San Francisco, California: The Castro, 10.4 miles away. San Francisco, California: SOMA, 10.4 miles away. Sausalito, California: Sausalito Yacht Club, 12.1 miles away. Ocean Beach, California: Coastline Panorama, 15.1 miles away.